A Barbican is a fortified outpost or gateway for defending the entrance to a castle or town. It was usually outside of the main defence wall. 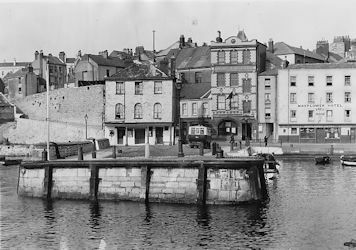 In Plymouth the Barbican was situated below the Castle, and not connected to the town by anything more than a pathway that later became Southside Street. The term Barbican has become the district name for the whole of the oldest part of the City, stretching from Notte Street and Vauxhall Street to the north, where it even includes North Quay, to Lambhay Hill and Phoenix Wharf in the south. West Pier, The Barbican, Plymouth, from the East Pier. The Seamen's Bethel, and the Mayflower Hotel. Note also Plymouth bus on route F.
World Wide Photos Inc., USA, 1941. The Barbican itself runs only from Commercial Road, previously Commercial Wharf, to the end-on junction with Southside Street. The Admiral MacBride Public House was number 1 but the old Customs Watch House and Police Station, demolished in the 1930s, were also within The Barbican. At the northern end the Dolphin Hotel was number 14, with the dining rooms of Mr R C Cload next door at number 15, on the corner with White Lane and the junction with Southside Street. Principle buildings of historic interest on The Barbican are the Admiral MacBride Public House, the office of the Cattewater Harbour Commissioners, the modern Mayflower Museum, the former LSWR Goods Receiving Office (Mayflower Gifts), Island House, the Crown and Anchor Public House, Platters Restaurant (12), Monty's Cafe (13), and the Dolphin Hotel (14 and 15). The properties set back behind the public seating area are actually part of New Street although there used to be two buildings on the site of the seating area itself. On the eastern side, upon New Quay, the present retail outlet is on the site of the former Fish Market. The line of cobblestones set at right-angles to the remainder of the stones on the Quay marks the extent of the original New Quay before it was extended to its present size.